All these 3D cards that you do are amazing. I sooooo want to try and make one myself. Hope it doesn't take me all day though. :) There's just so much detail and work in them I think. Well, aren't you all warm & wonderful in Texas??! We have snow, snow, & more snow coming down right now ~~ send some spring our way!! Gorgeous card --I *love* LLS but never got it. Maybe because I knew I'd want to cut those darn flowers out!! LOL!! It was definitely worth it though --so beautiful!! Hey Lady!!! What a gorgeous card. I love the color combo you used. To me, you're SUPERWOMAN!!! Great job as always. Hope you are having a great weekend. The hubby and I went out to dinner tonight (just the two of us, woo, hoo) and when we got out of the restaurant, it was snowing like crazy. We are on blizzard watch for tomorrow, YUCK! Hope you are enjoying your 70 degree weather...LOL! Talk to you soon. beeeeeautiful! I love cutting out those flowers LOL... but a punch would be cool! This is terrific...nice BG...I almost thought it was DP on my first glance! This is just beautiful, Kendra! I can't believe you hand cut those daisies - I just don't have that kind of patience! LOL. 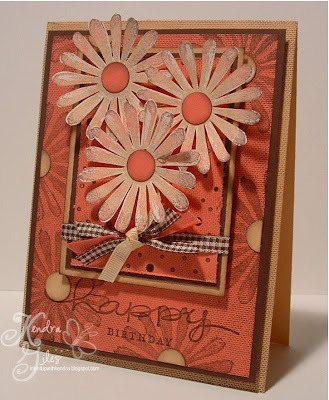 Those saffron centers on the background flowers make this card ROCK! Would you spare us in Michigan a few degrees? I hear ice hitting the house. At least I get to look at pretty flowers-these are gorgeous and my favorites anyways. WIsh it were June and they were peeking out near the deck. What a gorgeous card! No wonder yours are so pretty - you put such a lot of great details into them. Yes those 70+ temps were nice, but that wind & dust yesterday were yuck! Hopefully the wind will quit today & we'll have a beautiful Sunday. I have a punch like this! Can't remember the name of the manufacturer, bit it's pink--if that helps. I'm wondering if I can cut a piece of fun foam with it and make my own co-ordinating stamp so that I can duplicate your card...keep up the good work! Oh Kendra what a wonderful card! I love everything about it. LOVE your new banner Kendra!! So cool! What a beautiful card! I haven't pulled out that stamp set for quite a while... thanks for the inspiration! I love that card. Great techniques. Thanks for sharing! Beautiful card! I love the color combo and the "shabby" look. I also love your new blog banner. Did you design it yourself? And what about your cool logo? I would like to get a logo and a banner designed for my blog, but am photoshop illiterate. I need help! Any suggestions? Oh super fabulous!!! Love it!